I am loving this LBD from Firefly Boutique. 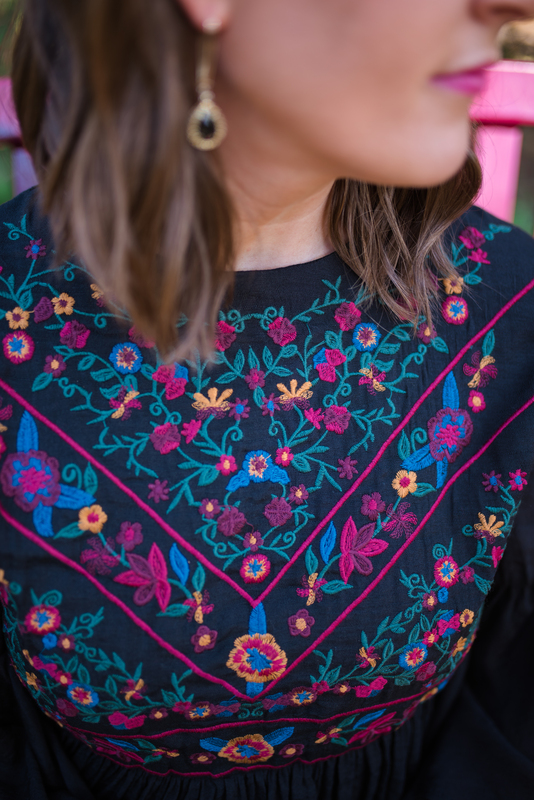 The embroidery detail is so pretty and the colors are perfect for Fall. The fit is very relaxed, but it is a little on the short side. Sizing up for length wouldn’t be the worst idea. These high-low bell sleeves add extra flair. When I wore this dress to a tailgate a few weeks ago, it was 90 degrees and I was comfortable, but I feel like the sleeve length could easily transition for cooler weather. The jewelry I wore with this is pretty gorgeous, in my opinion. The fabulous rings are from my friend, Lindsay Parker, of the Antiquarian. She is an incredible jewelry designer and has the most lovely pieces. The bracelet is from Talbots, but is no longer available. I’ve linked some similar options below. The earrings are Kendra Scott. I love the daintiness of the drop. They are very lightweight and easy to wear. They are linked if you click the above photo. And finally, one of my favorite parts of this entire outfit: the SHOES! These booties are perfect for Fall and they can add a pop of color to any outfit. The heel is such a great height. It gives a little lift, but easily something you can wear all day. The tassel is another great detail. The best part, however is the price. These bad boys come in under $50! These are currently sold out online, but the two pairs below are also under $50 and look very similar. This look is so versatile and easy to wear. I hope y’all love it as much as I do! Let me know what you like (or don’t like) about it!